Every year Handforth Gardening Society holds a Spring Show. 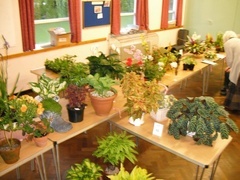 The show entry is exclusively for members of the Society. Mix dry ingredients, rub in fat, add buttermilk until a soft dough. Knead quickly until smooth, make it into two balls, roll in oats. Place on a greased tray, press into a circle and cut a deep cross in it. Bake at 200C or gas mark 6 for approx. 30 minutes until brown and hollow sounding when knocked on the bottom. 31 A piece of art eg picture, photo, ceramic, three dimensional figure.